FILE - U.S. President Donald Trump looks on during a meeting with China's Vice Premier Liu He in the Oval Office at the White House in Washington, Feb. 22, 2019. A new survey shows a widespread lack of confidence in U.S. leadership from residents around the world, with only 31 percent approving of the job performance of American leadership, which drops it below global perceptions for both Germany and China. The new poll by Gallup, released Thursday, shows that during President Donald’s Trump second year in office, views of American leadership remained roughly the same after dropping 18 points during Trump’s first year. Both China and Russia gained considerable ground in the survey, which is based on responses from people in 133 countries. China’s median approval rating rose to 34 percent and Russia’s rating reached 30 percent, nearly equaling the U.S. number. FILE - Chinese President Xi Jinping smiles before a meeting with Russian leader Vladimir Putin in Ufa, Russia. ​Those gains in Russia and China’s approval numbers were thanks in part to large increases, by 10 percent or more, in more than a dozen countries. Many of those gains were in nations where the United States lost ground, including Mexico and Turkey. According to the survey, Germany’s leadership received the highest median approval number, at 39 percent. However, this was Germany’s first score below 40 percent in a decade. The research, which Gallup has been carrying out since 2007, showed that respondents disapproved of U.S. leadership more than any other world power asked about in the poll. The U.S. disapproval rate was 40 percent, considerably higher than the disapproval numbers for Germany (22 percent), China (28 percent) or Russia (31 percent). Gallop’s Global Managing Partner, Jon Clifton, said in the report that Trump’s “America First” foreign policy wasn’t designed to win friends around the globe and noted that Trump has taken many unpopular global measures since he took office, including pulling out of the Trans-Pacific Partnership trade agreement, the Paris climate accord and the Iran nuclear deal, as well as engaging in trade wars with Europe and China. Clifton says that while Trump’s actions were not intended to make America popular, their effect could cost the United States in terms of foreign policy leverage. He cited research from Dartmouth College and the University of Sydney that found public opinion around the world about U.S. foreign policy does affect countries’ policies toward the United States. In November, a survey released by the Pew Research Center found similar global views about the United States. Data from 25 countries showed that respondents had little confidence that President Trump would do the right thing in global affairs and rated him lower than German Chancellor Angela Merkel, French President Emmanuel Macron, Russian President Vladimir Putin and Chinese President Xi Jinping. 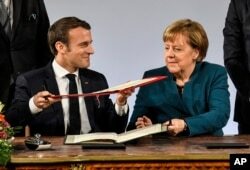 German chancellor Angela Merkel and French President Emmanuel Macron exchange documents during the signing of the new Germany-France friendship treaty at the historic Town Hall in Aachen, Germany, Jan. 22, 2019. Europe is the region in which the image of U.S. leadership fared worst, according to the Gallup survey. The approval rating of American leadership on the continent was 24 percent, down 1 point from the previous year. The disapproval rating was 59 percent, up three points from 2017. The European country that had the most positive rating of U.S. leadership was Kosovo, at 80 percent, which also led the world in approval of U.S. leadership. Only one other European country had a majority of its population report a favorable view of American leadership in 2018: Albania, at 69 percent. The European country with the least favorable view of U.S. leadership was Russia, at 11 percent. However, Russia’s view has increased 9 percentage points since Trump took office, and Russia no longer gives the lowest approval rating of American leadership in the world, which was the case during the Obama administration. Other European nations that gave the United States an ultra-low approval rating were Norway (12 percent) and Sweden (13 percent). While Europeans’ approval of American leadership was low overall, their view of Russian leadership was even lower, at 21 percent. They equally frowned on the leadership of Russia and the United States, with nearly 6 in 10 Europeans disapproving of the leadership of the two countries. Europeans had the highest view of Germany’s leadership, with 56 percent approving. That number was similar to the previous year, at 54 percent. 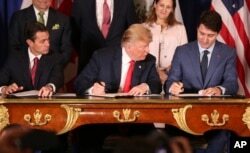 FILE - President Trump, looks over at Canada's Prime Minister Justin Trudeau's document as they and Mexico's President Enrique Pena Nieto sign a new United States-Mexico-Canada Agreement that replaces the NAFTA trade deal. The perception of U.S. leadership increased last year among its closest neighbors, rising in the Americas from 24 percent to 31 percent. Increases were made in every country in the region except three: Canada, Chile and El Salvador. The countries that had the biggest positive increases were the Dominican Republic, Nicaragua and Haiti. During a year in which the United States renegotiated the North American Free Trade Agreement with Canada and Mexico, those two countries had two of the highest disapproval numbers for U.S. leadership. Seventy-nine percent of Canadians and 74 percent of Mexicans disapproved of U.S. leadership in 2018. Overall, the region was more likely to approve of Germany’s leadership, giving it a 35 percent approval rating. Approval of China’s leadership, at 30 percent, was similar to the United States, while Russia came in last at 28 percent. While the approval numbers for all four countries, the United States, Germany, China and Russia, were roughly in the same range in the Americas, the disapproval rating for the United States was much higher (53 percent) than for the other countries, which ranged from 24 to 33 percent. Respondents in the Americas were also much more likely to say they didn’t know enough about the leadership of Germany, China and Russia to either approve or disapprove, with more than a third having no opinion or declining to answer the question. Only 17 percent of respondents had no opinion or did not answer the question regarding U.S. leadership. FILE - Philippines President Rodrigo Duterte marks the 117th Philippine National Police Service anniversary at Camp Crame in Quezon city northeast of Manila, Aug. 8, 2018. The approval of U.S. leadership in Asia increased by 2 percentage points since last year, but still remained in record-low territory at 32 percent. The region, defined by Gallup as including East Asia and parts of the Middle East, approved of both the leadership of Germany (36 percent) and China (34 percent) more than the United States. Russia was seen as equal to the United States at 32 percent. Majorities in just five countries in the region approved of U.S. leadership: Israel (67 percent), the Philippines (61 percent), Mongolia (60 percent), Nepal (55 percent), and Myanmar (52 percent). The countries or regions with the lowest approval of U.S. leadership were Iran (85 percent), the Palestinian territories (81 percent) and Yemen (75 percent). Gallup said the two factors that probably hurt the U.S. image most in the region were the escalating trade war between the United States and China, and the U.S. withdrawal from the Iran nuclear deal. Despite the low approval of U.S. leadership in the region, the U.S. rating declined substantially in only three countries: Iran, where the United States renewed sanctions; Turkey, which was engaged in a trade dispute with the United States; and Cambodia, where the United States has threatened sanctions over the political climate. Positive views of U.S. leadership increased substantially in several countries in the region, including India, Taiwan, Bangladesh and Uzbekistan. Zimbabwean President Emmerson Mnangagwa, left, arrives at Robert Mugabe International Airport in Harare, Zimbabwe, Monday, Jan. 21, 2019. The image of the United States is strongest worldwide in Africa, according to the Gallup survey. More than half of African respondents (52 percent) were positive toward American leadership. The number is higher in most sub-Saharan African nations and lower in North Africa. There were only five countries in all of Africa where residents were more likely to disapprove than approve of U.S. leadership: Namibia, Algeria, Tunisia, Libya and Morocco. The countries with the most favorable view of the leadership of the United States were Togo, Guinea, Niger and Ghana, all of which had at least two-in-three respondents expressing support. Favorable ratings for the United States rose by double digits in four countries: Rwanda, Zimbabwe, the Republic of Congo and Niger. Africans also had a favorable view of China, which has invested heavily in the continent. Approval of the leadership of China was 53 percent, one point higher than the approval of U.S. leadership. Both China and the United States had low disapproval ratings, with 16 percent for China and 19 percent for the United States. Approval ratings for the leadership of Russia (37 percent) and Germany (46 percent) trailed those for the Untied States and China.